The retro, old- school feel of the record is apparent from the outset. Gappy Ranks’ tone on the opening track Mountain Top is deep and coarse, yet at the same time smooth, appropriate for the tempo of the ‘Step It Out’ riddim which serves as the backdrop. His deejay skills are on display as he chats upon the riddim with slow precision, expressing his appreciation for the ghetto youths like himself who make it, so he’s going to ‘shout it from the mountain tops’. Incidentally this was Gappy’s first song to rise on the UK Reggae Charts. The smash hit Heaven in Her Eyes follows. Gappy shows his versatility here, beautifully singing on a tune that remained at #1 on the UK charts for 13 consecutive weeks and introduced him to an international audience. Definitely a Boomshot! 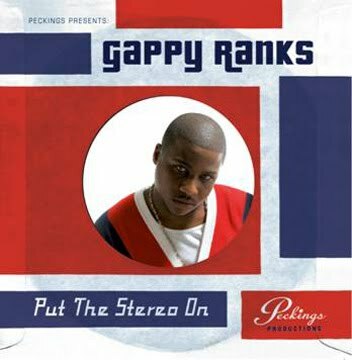 On the title track and first single, Put The Stereo On, Gappy paints a vivid picture of his childhood and the music that influenced him to enter the Reggae scene. The revered ‘Hot Milk’ riddim suits Gappy’s flow as he sings: “Daddy, please, I beg you, put the stereo on…Take out a 45 and play de Studio One”. Wicked Riddim…Wicked Lyrics…Wicked Delivery…Boomshot! When recording the record Gappy Ranks was granted access to classic reggae riddims like the Treasure Isle produced riddim featured on Happiest Day of My Life. He delivers again with a lovely, personal rendition of a theme written about in literally every genre of music. Nice tune! Musical Girl is yet another stand- out track and arguably the best song on the album. The ‘autotune’ on Gappy’s voice adds a modern dimension and actually fits harmoniously with the vintage rocksteady riddim used on the track. Certainly one of many highlights of the album! The second half of the record presents Gappy at his ‘rootical’ best. The conscious tunes start with a friendly request for A Little Understanding from mankind and the world would be a better place, which transitions into the powerful Thy Shall Love, a plaintive cry for the masses coupled with the admonition to love not only themselves but also one another. So Lost pinpoints the difficulty of choosing the right direction in life and the inherent spiritual need that must be satisfied in order to find our way. Frenchie’s (Maximum Sound) updated version of Bunny Lee’s ‘Creation Rebel’ riddim underpins Gappy’s expressive and dynamic lyrical flow on Heavy Load. To close the set UK legend Nerious Joseph lends his talents to a top- notch version of Marley’s Soul Rebel, with Gappy’s Tony Rebel- like chat flowing like Dunn’s River Falls. ‘Put The Stereo On’ has something for everyone. Gappy Ranks adroitly bridges the gap between classic and modern reggae music. The timeless riddims and old-school feel will impress anyone who appreciates vintage reggae while the modern topics and delivery will appeal to the younger generation. His extraordinary ability to transition from soulful singing to singjaying to rapid fire deejaying is a skill that very few even attempt let alone master. Without question, ‘Put The Stereo On’ is one of the best reggae albums of 2010. CRUCIAL!